If you have a clear idea of buying Yamaha piano to learn how to play piano, I will give a closer look at Yamaha YPG 535 review today. ​This 88-key portable grand piano keyboard is described as one of the most popular products from Yamaha. Moreover, it’s equipped with a grand piano sound and highly authentic-key action. Especially, it comes with an attractive backlit LCD together with other f​​​​eatures that allow you to use the piano for various playing styles and applications. However, before deciding to buy it, you need to know this product thoroughly, right? Is this piano truly suitable for you? Does it have any pros and cons? Etc. Down here and find answers now! Who is The Yamaha YPG 535 Appropriate? How does the Yamaha YPG 535 compare to other keyboards? How can I Load External Music Files? How can I Save My Personalized Settings? How can I Connect The Yamaha YPG 535 to My Computer/Laptop? How can I Enhance My Playing With This Digital Piano? Can I Learn to Play Piano With The YPG 535? Well, this digital piano is actually suitable for anyone, from newbies to seasoned piano enthusiasts. For instance, if you’re a beginner, the Yamaha YPG 535 is very easy to use. Since it includes everything you need, you are able to know how to use it instantly. Or in case you’re an experienced player, this piano also gives lots of features that help to promote your performance. Additionally, its suite provides a chance to make you advanced at learning new techniques while playing. How about those need the piano for performance? They will be impressed with the high-resolution stereo sampling from this digital piano as well. Furthermore, its advanced technology guarantees every sound comes with the perfect pitch and tone. What’s more, applying various pressures to the keys to create softer and louder sounding notes is easier. You have a general view of this digital piano after reading information about its specs and features above, right? 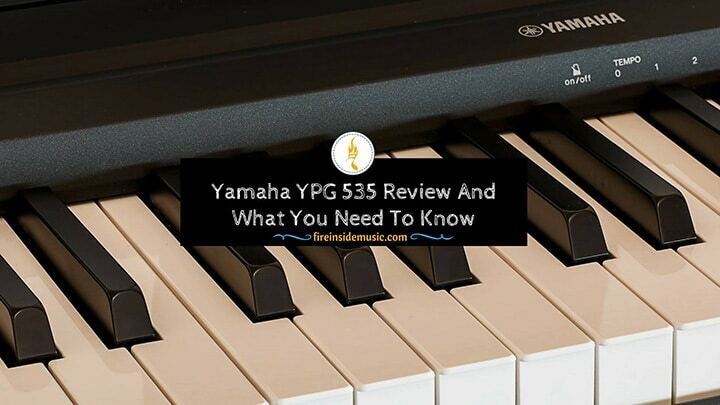 Now, it’s time to dive into the Yamaha YPG 535 review to find whether it’s the amazing keyboard for you. Indeed, this digital piano is not too big, and I might confirm that it has the right size that anyone wants. Besides, it includes a keyboard stand that is measured about 2 ½ feet high and 4 feet long. Although it’s not the lightest piano with 17kgs, it’s better than other 23-or-25-kg models out there. Let’s talk about its design! It can be said that I rather impress its distinctive color, called Gold Champaign. It’s a nice color that you haven’t seen on any digital pianos or keyboards for sure. Moreover, with an elegant black color surrounding the cover of the keyboard, it’s perfectly fit to the stand. As outlined above, this YPG 535 includes 88 keys that are similar to the acoustic piano keys. And all are made from plastic. When it comes to the mechanism, it highlights Graded Soft Touch (GST) action keyboard, which has the lowest price amongst 3 different ones from Yamaha. So, that’s the reason why you might hear some clicks when playing. But, it definitively feels better than some cheap entry-level keyboards. Additionally, the keyboard is touch-sensitive. That means the harder you press the keys, the louder the sound is. Plus, the level of touch sensitivity can be regulated to correspond with your playing style. Vs. P45 digital piano, the YPG 535 stills has Yamaha’s proprietary Advanced Wave Memory (AWM) Stereo Sampling technology. Hence, you can hear its sound like an acoustic piano recorded at various volume levels. Meanwhile, a proper sound is activated via the force that a key is pressed. When making mention of the sound in the Yamaha YPG 535 review, I extremely prefer a massive range of instrument sounds. There are 500 internal sounds to play including 12 drums/SFX kits, 127-panel accessible sounds, and 361 XGlite additional sounds. 4 types of the chorus make the sound thicker and more vibrant. 9 types of reverb make the sound bigger like you’re playing in a big room or hall. 26 types of harmony allow you to harmonize additional notes, making full chords. What’s more, the master equalizer settings permit you to adjust the sound that depends on what reproduction system you’re playing like external speaker system, keyboard’s internal speaker or headphones. This digital piano is attached with a 2-way speaker system. That means the sound range is separated into 2 sections and played through the standard speaker units in order to give clear treble and loud bass. Besides, the speakers transfer well-balanced and full sound in both low and high register. As a plus, their front facing design makes the sound more open and clearer. In case you play in a relatively small room, the total power output of 12W from the speaker is loud enough. But, if playing for a live performance, it’s best to attach an external amplifier to increase the sound. Since the YPG 535 has 5 ports, you can connect it to various kinds of external devices with ease. And all are placed on the rear panel. Now, I will explain 4 different connections so that you can understand each clearly. It’s used to link a USB flash drive directly to the keyboard so that it can exchange MIDI files. That means you can load downloaded songs from the Internet into the piano and use them. Or you can transfer recorded songs from the piano to the USB. Although this piano doesn’t come with MIDI Out/In ports, you still transfer MIDI data to the computer through availing this connectivity. Firstly, you need to buy an A to B USB cable at any electronic store. Then install a USB-MIDI driver on the computer. Next, connect the YPG 535 to it, and you can use it as a MIDI controller. It’s used for connecting the sustain pedal. But, you only connect it with either a sustain pedal with a ¼” plug or the included FC5 one. The ¼” jack is used to plug in a group of headphones. If using this jack, the speakers will shut off by themselves so that you only hear the sound you’re playing. Additionally, this jack is availed as a Line Output to connect this digital piano to exterior speakers or amplifiers because it doesn’t include dedicated Line Out jacks. As mentioned above, you don’t need to buy a stand because this product offers a nice one. And it only makes the piano’s weight up to 17kgs. So, it’s suitable for home use. But, if you’re going to take it on the road for performance or use for gigs, the stand might be cumbersome. Hence, in case you want something portable, you might search for some X-type stands, which is adjustable and gig-friendly. The Yamaha FC5 sustain pedal might be enough for beginners, but the experienced players need something more substantial since it doesn’t provide much control. If you need another choice, you can consider the M-Audio Sp-2 sustain pedal with a solid metal build, which is quite similar to an actual piano pedal. The YPG 535 provides the Artiste Series Keyboard Bag, which fits this piano perfectly, making transportation easier. Aside from main points of the Yamaha YPG 535 review above, this product comes with lots of features. And after discovering them, you will never feel bored with this instrument. The Split Mode will divide the keyboard into two parts and permit you to play different sounds with your right and left hand. Meanwhile, the Dual Mode allows you to layer two different sounds. Hence, when pressing a key, you can mix and create a more complicated sound. The YPG 535 offers a 6-track MIDI recorder so that you can record more than 6 pieces of music and then play them back. Even, you can transfer the music to the computer via the USB ports. 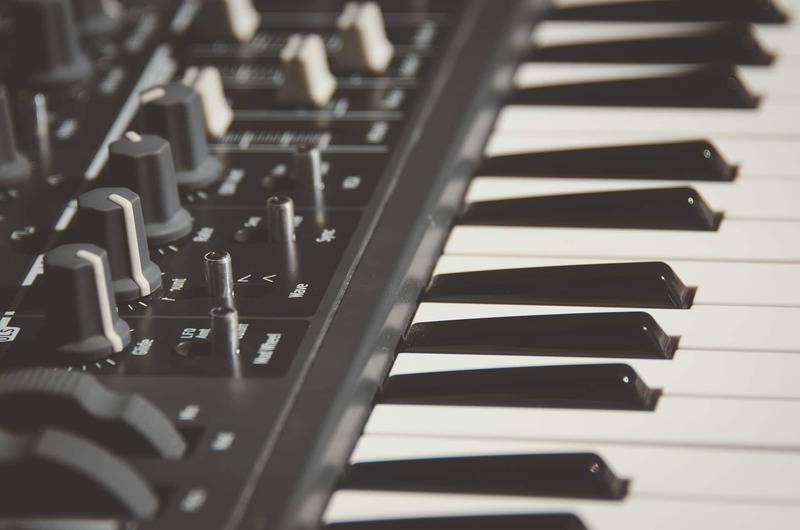 Since you’re recording in MIDI, you can change the instrument sound or tempo and add effects or notes after finishing the recording. How wonderful it is! By using the Lesson Mode and Performance Assistant features, you can play back and learn how to play 30 internal songs and 70 ones on CD-ROM with ease. Even, the keyboard is able to show the scores of the lyrics and melodies if they have lyrics data. One of the most exciting things that I rather prefer is Yamaha Education Suite. It permits you to play internal songs for both hands or each individually. And it includes 3 different kinds of lessons. Until you press the correct note shown on the display or the song still waits. So, if you don’t know how to read a piano music sheet, you can play the exact keys since the display shows you every note. Depending on your playing’s speed, the tempo of the playback can change. In case you play the wrong note, the melody will slow down and turn back to the initial tempo. This permits you to practice at your speed. You are free to pick up any part you want to practice (both right and left hands). Or you can choose to play only one hand while the other will be played by itself at the standard tempo. Indeed, the YPG 535 is ideal for all demands, from beginners to experienced players. You are able to play instantly since all the features are easy to use and navigate. While there are some significant features as mentioned above, this digital piano also comes with some drawbacks. The 88 keys are only semi-weighted that make a real piano player feel unsatisfied. All in all, the Yamaha is a good piano for those who want something sturdy to go with any skill level. In case you’re demanding and want the weighted keys, there are other choices out there to consider. The Yamaha P45 is an entry-level digital piano that is quite cheaper than the YPG 535. However, it provides more values regarding piano playing. When it comes to the mechanism, the P45 is equipped with the Graded Hammer Standard (GHS) action with fully-weighted keys. Moreover, its notes of polyphony are double with 64 ones, giving much more vibrant and fuller piano sound. But, since the AMW Stereo Sampling of P45 only comes with 10 instrument sounds, this piano aims at mostly beginners. Similar to the Yamaha P45, the P115 is also equipped with the GHS action with fully-weighted keys. Additionally, it comes with 4 touch settings, giving the best quality sound. Plus, it has built-in speakers and woofers on the right and left sides of the keyboard, bringing the low frequency with a vibrant tone. The DGX 660 is similar to the YPG 535 when this 88-key piano provides a complete capability of learning, playing, music production, and so on. It includes 554 built-in instrument sounds, up to 200 accompaniment styles, tons of effects, 100 preset songs, audio recorder, and 6-track MIDI recorder. Moreover, it’s equipped with all types of jacks and ports for linking to external devices, even plus the Aux in and Microphone jack for playing music from smart devices. Of course, it’s included a matching stand and a big LCD screen. However, the BIG difference is that the DGX 660 boasts its Graded Hammer Standard action which is excellently delivered by the 192-note polyphony and Pure CF sound engine. As a little brother of the YPG 535, the Yamaha YPG 235 has acquired nearly the same functionality. It also has the same number of instrument sounds, rhythms, internal songs, styles, features, etc. Compared to its 88-key brother, the 76-key YPG 235 includes a compartment for batteries. That means it’s more mobile and permits you to use it anywhere without AC power (outdoors, for instance). But, it doesn’t provide the USB to Device port and the stand as well as showing the lyrics of the song because of the small screen. The Yamaha YPG 535 offers an expansible music database. That means you are able to load in your preferred songs and it will choose the correct voicings for the right hand, the proper musical style, and the right tempo for the piece automatically. Even, you can search for any piano music piece that is included in MIDI format, load and play it easily. This digital piano comes with the registration memory that permits you to save more than 16 user settings. And the most interesting thing is that you can upload anytime. So, it’s quite ideal for a classroom setting or a shared digital keyboard since it permits other people to use and store their personalized settings as they want. As outlined above, the YPG 535 has 2 USB ports on the back that permit you to connect it to a host so that you can plug in and perform for smooth playback and recording with MIDI files. Obviously, you can link the USB to a device, giving the quick and straightforward way to transfer data back and forth from the piano to computer/laptop. And this also works well for thumb drives, floppy disks, and USB flash ports. If you read the Yamaha YPG 535 review from the beginning, you will discover this digital piano comes with an advanced LCD screen. It can show chords, notation, and lyrics of any song you want to play. Even, it displays automatically annotated music whether you’re playing it by yourself or saving it from the Internet. Hence, this feature is actually useful for those who are anxious about spending too much time on reading the sheet music. Especially, it’s also advantageous to singers since you can read the lyrics on the screen and sing along to your own music. Another important point is that the YPG 535 might detect the voices that are necessary for the music depending on the uploaded songs. It decreases the guesswork and tiresome process of going through sounds to pick up the correct one for the songs you play. Although the 88-key keyboard is just semi-weighted, it allows you to perform the perfect songs, solos, chords or arpeggios all the time. Besides, you can direct the pitch and pace by moving your fingers slower or faster up and down the keys. As mentioned above, the built-in learning feature, called the Yamaha Education Suite, helps you learn to play piano by providing 30 available songs and 70 ones on the CD-ROM. And each song is divided into right and left hand as well as different levels. Interestingly, this feature provides a waiting mode that will wait until you press the correct note before continuing, a lesson grading system that allows you to check your progression, and a tempo mode that introduces the song into the tempo you’re playing. In summary, the Yamaha YPG 535 is a great instrument for learning. After finishing the Yamaha YPG 535 review, you need to understand 2 crucial things before deciding to buy it or not. The first thing is that this digital piano is equipped with the semi-weighted spring-action keyboard. That means it doesn’t give an actual feel of piano action that piano enthusiasts want. The second thing is all about its 32-note polyphony, which is quite constricting for seasoned players who want to play complicated classic pieces. In case you don’t feel annoyed at the things above, I bet you will love the Yamaha YPG 535 for sure. It’s one of the most popular keyboards under $1000 and has lots of positive reviews from users. It also comes with a whole range of graded velocity-sensitive keys, hundreds of built-in sounds and impressive features for learning and even music making. Particularly, this instrument provides some kinds of lessons that can teach you to play lots of the internal songs. Besides, the LCD screen is able to show music lyrics, scores, and keys. Wonderfully, you can enrich your performance by using dozens of accompaniment styles, effects, and rhythms available. Plus, the high quality of the sound definitively impresses even pro while the simple use of the system helps you use easily without the user manual. And I believe that you never feel bored with the Yamaha YPG 535 no matter who you’re a kid, newbie or experienced player. ORDER it now if you want a reliable way to learn, practice and improve your piano skills on the digital grand piano. Assume you still have any question related to this product, just leave your comment below so that we can discuss together. And please SHARE if it’s useful, not only for yourself but also the others.